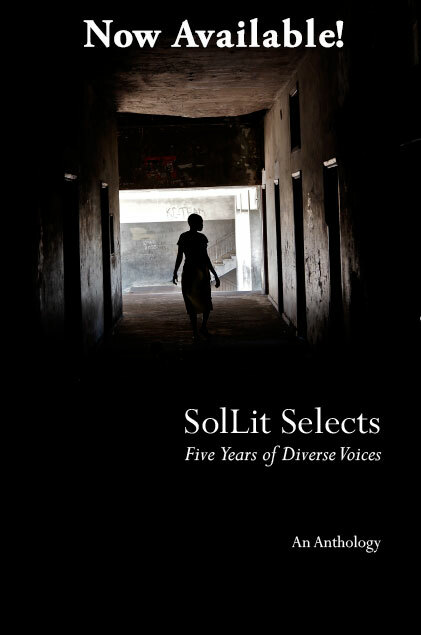 MT: Your short story “The Edge” is included in SolLit Selects: Diverse Voices, the magazine’s first print anthology. Congratulations! Could you tell us what inspired you to write this story? JS: I’m fairly sure Russell Banks’s “Sarah Cole: A Type of Love Story” was the initial inspiration for “The Edge.” It’s been many years since I read that story, but I remember it was about a woman whom everybody rejected for her looks and she is seduced by a man who later turns on her in a very cruel way. Of course, the theme of people marginalized because of their appearance is at least as old as the Latin saying monstrum in fronte, monstrum in animo (monstrous in appearance, monstrous in spirit), but I persist in thinking Banks’s powerful story, rather than, say, The Elephant Man, was what got me going on my version. Some people might say “The Edge” is “really” about, oh, particle physics or the difficulties of eyewitness testimony or the Humean critique of the problem of induction, but I don’t think a fiction writer sits down and thinks, “O.K., now I’m going to write my critique of inductive reasoning story!” At least, I hope not. MT: I found it interesting that the protagonist, Osvaldo, had two nicknames—“The Bad” and “Angel Eyes.” The two names are very contradictory in their definition and how they depict Osvaldo, almost like two halves that make up his whole. The two nicknames made me think of the image of a devil on one shoulder and an angel on the other fighting to control the morality of an individual. Was this the idea behind giving Osvaldo two nicknames and connecting those two nicknames to how people viewed his physical features (particularly his eyes)? JS: Great observation. I hadn’t really thought of that play between the two nicknames, but now that you point it out and my curiosity is piqued, I have called upon good old Wikipedia to see if this tension existed in the character of the Bad, aka Angel Eyes, in the movie The Good, the Bad, and the Ugly (the source of Osvaldo’s nickname). Alas, it seems the Bad (played by Lee Van Cleef) was the flattest of the three characters, with director Sergio Leone saying he “has no spirit, he’s a professional [sociopathic mercenary] in the most banal sense of the term.” Curiously, the original Italian script of the movie gives him the name Sentenza (“Judgment”), which you would think would have led to the development of some kind of avenging angel motif, but I guess not. In “The Edge,” Osvaldo’s homies would like their enemies to see him as ruthless and cold-blooded as Lee Van Cleef is in the movie, a role that makes Osvaldo very nervous indeed. MT: In early April, SolLit shared a guest blog titled, “Foreign text in English Writing.” The author shared her enjoyment of reading foreign words in English text. She felt that in stories that depict different cultures, the use of such words provides an air of authenticity to the story. I notice in your short stories that you often include Spanish words or phrases, but don’t necessarily define them. How do you decide when and what Spanish words to include in your short story? Do you find it challenging to include foreign language words and build in context so readers can understand it? Or do you prefer the definition be vague for readers who don’t understand the language? JS: I try not to use foreign words and phrases without making their meaning clear from the context, because I can understand a reader’s frustration in feeling she might be missing something beyond the air of authenticity such words impart. So I wouldn’t want to use Spanish in my stories as extensively as Fitzgerald uses French in your blogger’s example, or as much as Cormac McCarthy uses Spanish in his border trilogy. But I also don’t like having to italicize the Spanish words, because it makes them stand out awkwardly, though I realize it’s probably even more awkward to have a character say “dime” (i.e., “tell me”) unitalicized and have the reader wonder what the hell ten cents has to do with anything. The editor I’m working with now says her press italicizes only the first appearance of a foreign word, which I guess is an OK compromise. Other book editors I have worked with insist on a glossary, which looks kind of funny in a work of fiction. In any case, it’s a thorny issue, and one that of course always comes up in the bilingual workshops I teach. MT: You’ve had other work published with SolLit,including “Looking Out.” The story seems to include many themes—experiences of a minority, adolescent love, child abuse, and hints at the possibility of sexual assault—though the reader is left to question whether the experience Jennifer had with Rufino was beautiful or a nightmare. It felt that the word sublime was also used to denote these different themes in the story. One of my favorite passages that highlights this idea is: She looked up the word ‘sublime’ in the index of a library psychology book. The entry was followed by subliminal, submission, and a little further down, suicide. She noticed the way the book’s cover dented the bright blue veins of her wrist, and slammed it shut. The sound was practically sublime itself, an echoing boom that made heads look up, including Rufino’s, who turned his strange face slowly to hers. JS: Kant describes the sublime as something that can make you fearful without your actually being afraid of it, if that makes any sense. And when it does start to make sense, you’ve entered into, dare I say it, sublime territory of which much great stuff has been written, my favorite being Burke’s A Philosophical Inquiry Into the Origin of Our Ideas of the Sublime and the Beautiful. In “Looking Out,” the mountains and the view from them are of course sublime, ladybugs are round little shiny things and therefore merely beautiful in the Burkean scheme, and the dog Jennifer and Rufino encounter, well, try as it might to seem fierce, it just can’t be sublime the way a wolf can. There’s something more than a bit sublime in Rufino’s ponderous, mountainous presence, I think. But again, I didn’t start the story thinking, grandiosely, “Now I’m ready to write my story about the sublime!” Instead, the story had its roots in a hike in New Mexico I took once with a woman I barely knew who seemed to get angrier and angrier the farther we went, until she finally burst out, “Don’t you dare tell me, ‘Look at that cactus’! Don’t ever say that.” I later learned she was known to be a bit of a nut. How the story got from that to “Looking Out” heaven only knows. In any case, the story has nothing to do with proper ways of indicating cacti, which are arguably neither sublime or beautiful. MT: Why is it important for you to share the challenging and difficult experiences of first and second generation immigrants? JS: The challenges and difficulties poor immigrants face in terms of acceptance are the same as the challenges and difficulties encountered in getting an audience for their stories. Their problems are so alien to those of most assimilated citizens (read: most readers) that it’s hard to get those citizens to connect with them. If they want to become visible to most people and have their stories resonate with the average reader, they need to become like them, suffering from affluenza, bratty children, career crises, etc. Still, although I don’t see many immigrant stories heading up the best-seller lists, there is a degree of interest out there, and immigrants to the U.S., especially those from Mexico and Central America, are people I know something about, so that’s why I write about them. It’s crazy how large they bulk in current political discourse and how little the people yammering about them actually know about them. José Skinner’s fiction has appeared in Solstice: A Magazine of Diverse Voices, Third Coast, Witness, Colorado Review, Quarterly West, and many others; his collection FLIGHT AND OTHER STORIES was a Discover Great New Writers at Barnes & Noble selection, a finalist for the Western States Book Award for fiction, and won recognition from the Latino Literary Hall of Fame. Before becoming a fiction writer and earning his MFA from the Iowa Writers’ Workshop, he wrote for the Mexican television company Televisa and worked as a Spanish/English translator and interpreter. He currently teaches English at the University of Texas-Pan American and directs the university’s MFA program in creative writing.